Water is the source of all life on Earth. Without it, anything living dies. Without it, there would be no civilizations. No people, no plants, no animals. No chance of survival. Nothing but inorganic stone and wind. Water is the most essential, and most essential survival resource known to man. In fact, we’re so dependent on water it can be described as a burdensome necessity. Right? My point is, water is life. Our daily lives depend on it. That’s why everyone, whether you’re a prepper or not, should keep a supply of survival water in your house. When disaster strikes, it often takes out municipal water systems and electricity grids first. Both of which are needed to keep municipal water running. And if that goes down, your access to clean drinkable water goes out the window. Unless of course, you have stored water at home. Exclusive Bonus Content - 11 Last Resort Home Water Sources - Finding water in the most unlikely of places. Click Here To Get Your FREE Copy Of It. Buying cases of plastic water bottles or using old milk jugs works but it’s not the most efficient method. Soft plastic bottles will leach chemicals over time (especially if exposed to sunlight). It’s far better to use water storage tanks. These handy aquifers come in all shapes and sizes so you can pick the right ones to fit your survival needs. The better ones designed to hold water with no chance of chemical contamination. Not just that, but they’re easy to refill. And you can rig water storage tanks to collect and filter rainwater to replenish your supply. There are no two ways about it; the world is facing a water crisis. It may not happen tomorrow, or next year, but in the future, there’ll be conflicts over freshwater. In fact, war is simmering on the Indian-Pakistani border over access to freshwater. And water wars will be ugly conflicts. Human will fight for any resource they can’t live more than a week without it. The same goes for neighborhoods, towns, and cities all around the world. When freshwater becomes scarce, people will fight with their lives for it. Neighbors turning on neighbors and friends turning on friends to get their hands on some. But you won’t have to because you’ll have your own supply safe at home, stored safely in your emergency water storage tanks. For every person the answer to “how much water should I store?” is different. Are you storing water for just yourself? Or will you be providing water for lots of friends and family members? Do you have any pets? The more people and animals that need water in your household, the more water you should store. How long do you want your independent water supply to last? The average person should drink about 1 liters a day (minimum). That means that, if you ration it out perfectly, 1 gallon will last you 3.785 days. Keep these answers in mind when you’re shopping for your emergency water storage tanks. They will determine what size/kind of tank you should buy. There are so many different kinds of water tanks out there that it can be overwhelming to find the right one. Big tanks, small tanks, stackable tanks, underground tanks, packable tanks, pillow tanks, etc. The list is almost endless but here are the most popular options on the market. 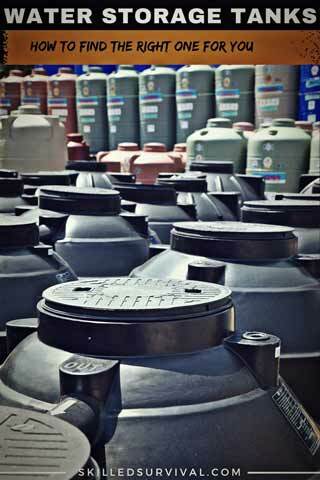 So here’s a list of all best water storage tanks for preppers – from smallest to largest. These are another common water storage option and particularly useful because they store so well. Designed to stack neatly on top of open another you can build a “wall of water” in your basement. If you add enough of these up, you get the equivalent of a large water storage tank with added portability and space-saving flexibility. A single water brink is far from a tank but what if you stacked 16 of them? At 3.5 gallons each, 16 of these would add up to 56 gallons – to me, that’s a tank. 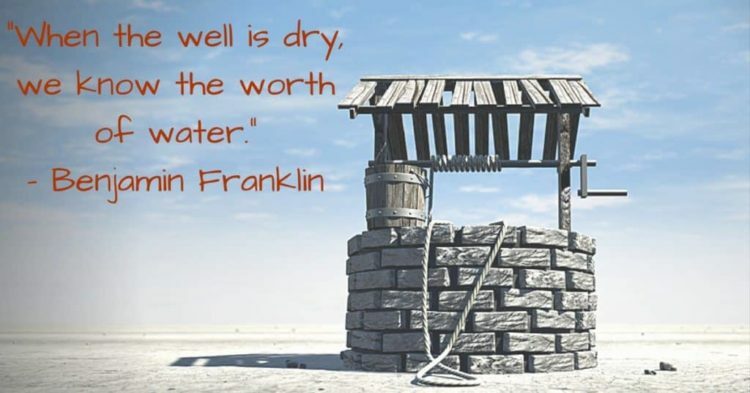 They are a solid investment and one of the best long-term survival water storage solutions. These rectangular mini-storage tanks are designed to stack together like Legos. So you can fit as many as possible with as little space as possible. They are made from 100% non-toxic, food grade plastic (that’s the good stuff that doesn’t leach chemicals). Sure, these are technically called “barrels” and not “tanks” but they serve a similar purpose – storing lots of emergency drinking water. These are the standard issue blue plastic barrels that are popular for water storage. They are simple, effective, that’s why they’re so popular. The Eagle Straight Sided Water Barrel is your standard issue drinking water container. It’s a rigid blue plastic barrel that comes with a built-in spigot. This particular model stores 55 gallons of water. That’s enough to last an adult a couple of weeks (with excellent rationing). Much like the bladder inside of you, these are stretchable bag containers. They fill up like balloons when filled with water. One important feature of a water bladder is when they’re empty, you can easily pack them in for travel. Aquatank2 has a water pillow that holds 300 gallons of fluid. This is ideal for keeping inside of cars, RV’s, campers and other vehicles but also at your home. The Aquatank2 packs away into almost nothing, it’s light, and it’s made of highly durable rubber that won’t easily rip or tear. You can also find this same tank is smaller sizes of 60 gallons and 150 gallons. You need to have space outside for one of these, but it’s a huge advantage to use a cistern system for two main reasons. 1) They store A LOT of water (often hundreds of gallons worth). 2) They can be rigged with rainwater collection systems for ongoing replenishment. Norwesco tanks are manufactured using resins that meet FDA specifications to ensure safe storage of potable water so it’s safe to use as a drinking water storage tank. This Norwesco Water Tank is rugged, corrosion resistant and lightweight with no seams, welds or joints to leak or rust. But you’ll need to store this somewhere where there’s a lot of space – like in the backyard, garage, in a big basement area or even a portable garage. It holds 35 gallons of water, which is more than enough to sustain you through a semi-serious disaster. You can buy one of these today and then buy more over time to grow your system over time without breaking the bank today. The RomoTech is another water tank that’s approved for potable water storage. The RomoTech Water Tank is a hard-sided plastic tank that’s about twice as big than the previous one. You probably won’t be able to store this water storage tank inside a typical house but it’s made to handle the outdoors. What’s nice about this tank (and the previous one) is that they are small enough to fit in the back of most pickup trucks. This means you can move them to a new location if necessary. It’s always good to have that option for future-proofing your survival options. If you’re interested in using your emergency water storage tank as a rainwater collection system it’s hard to best this tank. This 100-gallon water tank includes a 12″ stainless steel strainer basket. It’s added to the top of the tank to keep out large debris (like sticks and leaves). The tank also includes a stainless steel screened overflow assembly. The screened overflow is designed for directing overflow water (during large rainstorms). The tank is made from polyethylene and is 100% Food Grade. It’s approved by the FDA with zero BPA. Here’s the Polymart 250 Gallons Tank if you want a larger option for your rainwater harvesting. This drinking water storage tank is designed to fit in your basement while taking up a minimum of floor space. Note: Measure your ceiling. These are 82 inches high. These Emergency Water Storage Tanks are made of a single composite piece of BPA free plastic, which means it’s safe for water storage and it has no seams that can leak. They are molded from a polyethylene composite independently certified by the National Sanitation Foundation (NSF). This monster of a tank holds a massive 550 gallons! It has thick, durable white plastic walls, which are semi-translucent. This allows you to easily check how much water you have left. You can’t fit this badass RomoTech Reservoir container inside though (unless you live in a stable). So to host a reservoir of this size, you’ll need a large backyard or some land. Refilling your water storage containers can be a pain, especially if you’re in a position where freshwater isn’t readily available. How can you re-up your water supply when there’s no running water to use? Well, the most obvious (and most natural) way to do that is via a rain collection system! In most places, drinkable water falls straight out of the sky. Don’t waste that resource! Collecting rainwater is an incredible survival practice. And it’s straightforward too. The more surface area your system has, the more water it will collect. Water that’s collected must be transported efficiently. Water that is transported gets filtered. When it comes down to it, a roof is probably the best rain collection you have. Every house has one, and they all cover a large surface area to catch the falling rain. With a simple gutter system, you can turn your roof into a water collection tool. Collecting the water that falls on it is funneled into one place: your water storage tank. Now, this works a lot better if you have a large, outdoor water storage tank or a series of water storage tanks. Then you can just direct your gutter system to move water directly into your tank. Note: Transporting water to an inside storage location is not only complicated, but it’s also risky. If something malfunctions, you could find yourself facing some serious flooding. If you don’t have access to a roof, you can still rig a rain collection system using other materials. Survival tarps are particularly useful for this. They are waterproof, light, packable, and offer lots of surface area. Tie up three of the four corners of the tarp, and use the third corner to funnel water into your water storage tank. You can also tie up all four corners and cut a small hole in the center. Place your storage tank under the hole, and water will spout out of the hole directly into the tank. Fortunately, maintaining your drinking water storage tanks is straightforward. Once you’ve filled them up and stash them somewhere safe, you’ve already done most of the hard work. However, this is one major issue you might need to overcome. The best place to store water to prevent freezing is in a garage or basement area. Water stored outside is prone to freezing. That’s bad news for two reasons. You can’t drink frozen water. It will expand when it freezes, which can damage your emergency water storage tanks. Storing water inside can be tricky, too, though. You should elevate the storage tank(s) on a palette, so they are up off the ground. And regularly check for leakage as that could cause flood water damage inside your home. If you store water outside and you live in colder regions, you have a big issue. There are a few options to keep your liquid water from freezing. You can bury the cistern which will keep the water at underground temps which is above freezing if you go down far enough. Or you can wrap your tank in insulation and then use some thick plastic (used for greenhouses) to trap solar rays helping to keep your water above freezing temps. But this still won’t work on long cold stretches on cloudy days. So you may also need to add a tank heater as well. The bottom line is you need to have a plan to prevent your water storage tank from turning into a massive ice cube. Even if you’re using water straight out of the tap, you still need water purification. Too many people trust their water supplies – it’s a dangerous mistake. Water purification allows you to collect water from external, natural sources safely. That means you can collect water from streams, lakes or rainfall all for general use. That is particularly useful when water lines go out. Without tap water, you’ll have to fill your emergency water storage tanks with water from somewhere else. This is dangerous if you don’t have the means to purify it. Some of the best purification methods are simple. Water purification tablets are my personal favorite because they are cheap and easy to use. There are also some fancy new ultraviolet filters that use light waves to kill all biotic life. But these are only used for smaller amounts of water. Here’s our post on all your water purification options. It doesn’t matter what kind of disaster you find yourself in; clean, safe water is a survival necessity. Any prepper checklist that doesn’t include a water storage is lacking. So make sure you have some kind of emergency water storage tank or water storage containers on hand, full, and ready to use. Without a proper amount of water storage you can consider yourself part of the unprepared masses or you can protect your families future with a water storage tank system. I love that you suggested wrapping it with insulation to keep it from freezing since the underground temperature can drop really low. With that in mind, I will be telling my best friend about this since he is the one planning to buy one and have it installed in their property. It appears that they have the tendency to have no water during the winter season since they are located in the highest part of the village. I see a lot of containers with outlets 2″ off the ground. Looking for something with a credible hand pump that can draw from the bottom and discharge through a hose to a smaller 2-5 gallon container on the ground adjacent.